While Mount Angel may boast about its Bavarian heritage, its citizens are just as quick to show their patriotism for the good ol U.S.A.
Thats why a group of volunteers are raising money to honor six branches of the military by installing new figurines in the citys iconic Glockenspiel that will temporarily replace the more permanent fixtures that were installed 10 years ago. 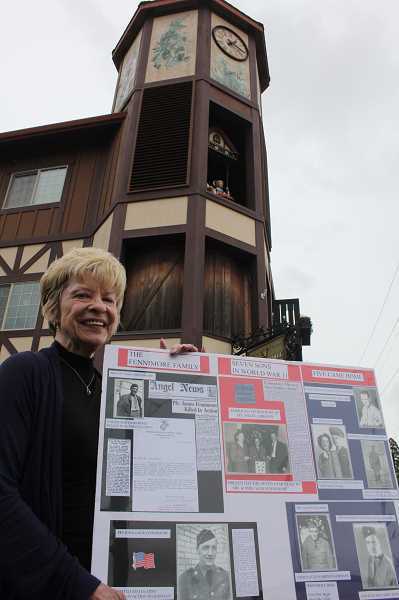 Henrietta Dill, developer of Edelweiss Village, the name of the property that contains the Glockenspiel, is working on the $30,000 project that will be unveiled at the end of the citys Fourth of July parade this year. The Army, Navy, Marines, Merchant Marines, Air Force and Coast Guard will each have a figurine represented in the clock tower, twirling to its branchs theme song at appointed times throughout the day. The figures will temporarily replace the current ones, which depict Mount Angels history: an American Indian, German settlers Robert and Kathrina Zauner, early community leader Matthias Butsch, Prior Adelhelm Odermatt (who established the Benedictine Monastery), Mount Angels first prioress Sister Bernadine Wachter and Papa Oom Pah who represents the towns Oktoberfest celebration. While being replaced in the Glockenspiel, these figures can still be viewed by the public, as they will be put on display at various locations around town, Dill said. The new ones will be up through Oktoberfest so all people that come into town can see them, Dill said. The Glockenspiel also features two children on a swing, hovering over the six newer figurines. They will remain, but instead of singing Edelweiss they will sing, God Bless America. Like Edelweiss, the recording of the new song will be done by Mount Angels St. Marys Public School students. Then it will swing back to the sound of Taps, Dill said, adding that all music production will be handled by Dave Keckes-Chartrey, of Z Musikmakers, a favorite local Oktoberfest band. A lot of people are involved in the process: carvers Terry Kramer, Mike Reifel and Carol Duree are using wood from Salem Wood Products. When completed, theyre being painted by Shari Watkins and will receive a paint coating by Vista Body Shop in Salem. Additionally, volunteers will switch out the figurines in the Glockenspiel the day before the unveiling, which is no small task. Theyre 5 feet tall and it takes two people to lift each one, Dill said. Dill pointed out that the figurines will represent more than one gender and nationality. The faces are generic, not modeled after anyone in particular, she added. The project costs about $5,000 per figure, but more than half of the $30,000 sum has already been raised, largely from a $5,000 Marion County Community Grant through the citys Façade Improvement Program, the Mount Angel Chamber of Commerce, the Mount Angel Community Foundation and private donations. The patriotic enthusiasm this summer doesnt end there. Anyone in Mount Angel is welcome to create a posterboard celebrating a veteran in their family, using photos, newspaper clippings and similar memorabilia. Any completed veteran board thats returned to Columbia Bank by June 28 will be displayed in the front window of one of Mount Angels businesses. An example will be on display at Columbia Bank of the Fennimore family, which sent at least seven sons to war in World War II (two never came back). 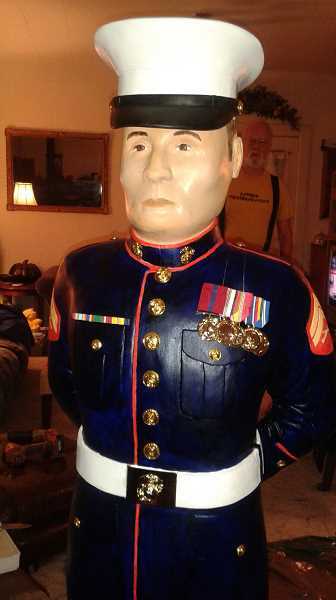 Well display them in the storefronts for all of July so people can walk around and see the individuals from Mount Angel who have served in the military, Dill said, noting that American Legion members and Mount Angel Towers residents are already working on their boards, and that the historical society will have a display in place at Columbia Bank. The unveiling of the new Glockenspiel will be immediately following the Independence Day Parade at 11 a.m. July 4. All are welcome, especially veterans, who will be honored as special guests. Donations toward the Glockenspiel project can still be made by taking money to any of the Columbia Bank branches in Mount Angel or Woodburn. Dill said the new display is not just a salute to Mount Angels patriotism, but to all veterans.